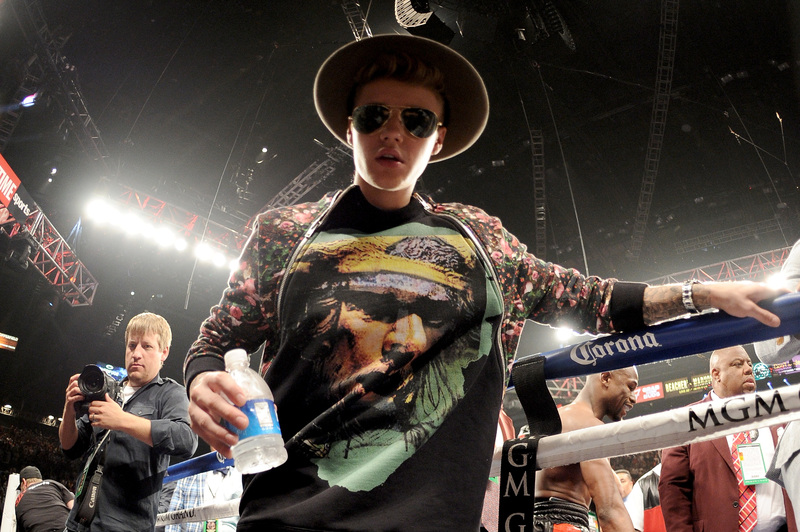 Justin Bieber might be a jerk, but he's not a jerk who steals people's cell phones. Of course, when news broke on Wednesday that Justin Bieber had attempted to steal a woman's phone at a mini-golf court, it wasn't like it was a hard story to swallow. Most news stories about Justin Bieber usually involve some sort of jerk move or legal trouble. There isn't a petition to have him deported to Canada because he's such a kind and charming burst of sunshine, after all. However, according to an employee's call to TMZ, Bieber never tried to grab the woman's phone and it was she who was the aggressor in the interaction. The woman works at the Sherman Oaks Castle Park, where the incident occurred, and she called into TMZ to claim that she witnessed the heated exchange between Bieber and the woman with the cell phone. The mother was "overly aggressive" and refused to listen to "security's requests to stop snapping pics". Furthermore, the employee says that Bieber never got physical with the woman nor did he try to take her phone, all of which could be confirmed by a surveillance video. As for why the woman's daughter started crying, the employee claims it was just because the little girl really wanted a picture with Bieber and "he didn't want pictures with anybody". After TMZ released their report of this new version of events, Bieber immediately tweeted a link to the article as a preface to a speech that is quickly becoming fairly common for him to make. In it, Bieber thanks people for standing by him and not believing damaging rumors about him as well as preaching positivity. As expected, his Beliebers have responded by trending #WeWillAlwaysSupportYouJustin on Twitter Thursday morning. The fact that Bieber sounds genuinely hurt by the accusation that he might have accosted a fan for their cell phone and made a small child cry makes him sound a lot more human and a lot less like the entitled brat we've come to expect him to be. It also goes a long way to explain why it's taken so long for any charges to be brought against him in #cellphonegate. If the incident truly went down as previously described, the woman would more than have a case against him even if that case wouldn't get Justin Bieber deported. Although TMZ states it is unlikely that they will ever actually get their hands on a surveillance video as the incident happened too far away from the cameras for there to be a clear picture of exactly what went down, it looks like this particular bought of unwarranted rudeness wasn't actually the latest on Bieber's laundry list of crimes against the American public. Should he be used to the fact that people are going to try to photograph him wherever he goes by now? Definitely. But getting angry that a woman was shoving a camera phone in his face and blinding him with the flash? That doesn't make him a jerk. That just makes him a person — who is often a jerk.